Multiple backup levels before uninstall. When a program is uninstalled we feel better if we know that we have a restore solution in case of a mistake or if the things go wrong. For this purpose Total Uninstall implements several levels of protection. A pre-uninstall system restore point. A full backup of the uninstalled files and registry. The files are deleted to Recycle Bin. 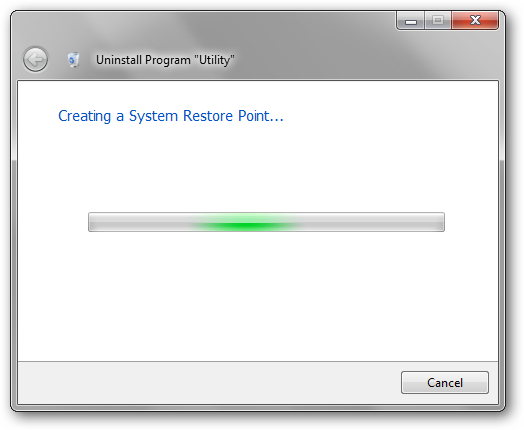 Total Uninstall creates a Windows restore point as the first step of the uninstall process. This will appear in the list of available restore point like Uninstalled with Total Uninstall "program name". It is necessary that the Windows feature is enabled and there is the necessary disk space available. We must know the limits of the restore points. A restore point contain a full registry backup and the system files. This doesn't protect your data or program data. Restoring the system to a previous point will not restore all deleted or modified files. The complete list of file extensions monitored and restored by the system restore can be read on Microsoft's site. 2. A full backup of the uninstalled files and registry. 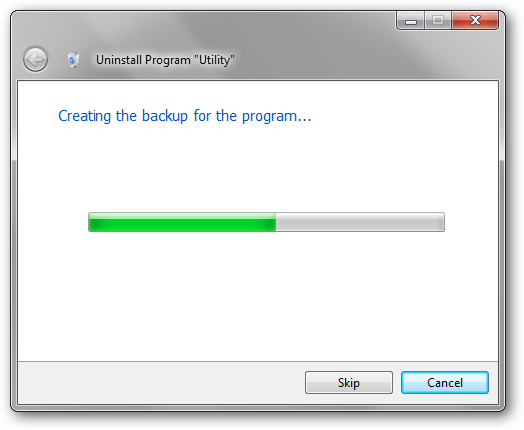 Total Uninstall will backup all files that will be deleted during the uninstall process. The archiving process can be skipped without interrupting the entire uninstall. The destination archive is a standard zip containing files with their full paths. The content can be verified and extracted using a third party file archiver program like WinRAR. 3. The files are deleted to Recycle Bin. Total Uninstall will delete the files to Recycle Bin. Because these safety features require disk space and increase the overall uninstall time the users have the complete control over each option. 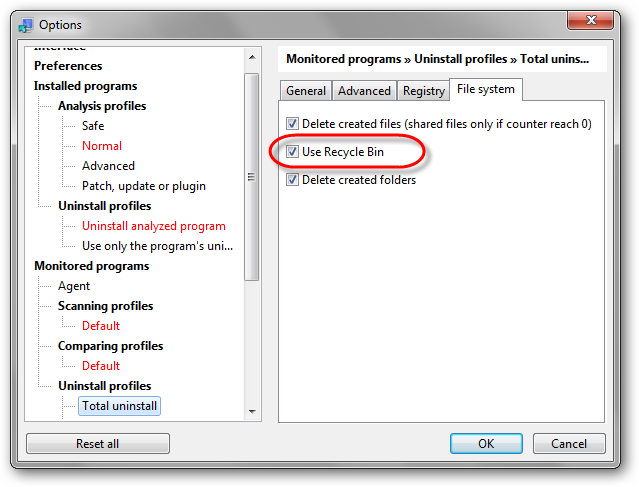 These are located in the program options at the uninstall profile level. We can create several uninstall profiles with a different combination of these options. 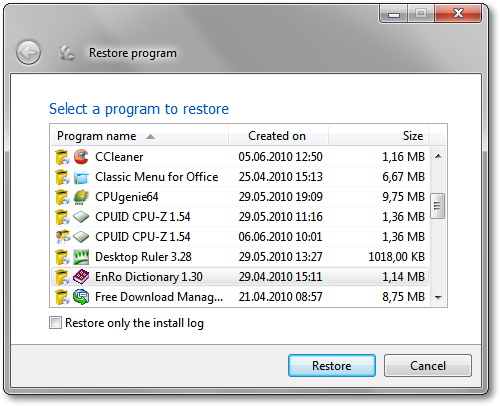 Simply select the program from the list and click Restore. The program is restored from backup completely. The corresponding program entry will be added in the Installed programs/Monitored programs lists. 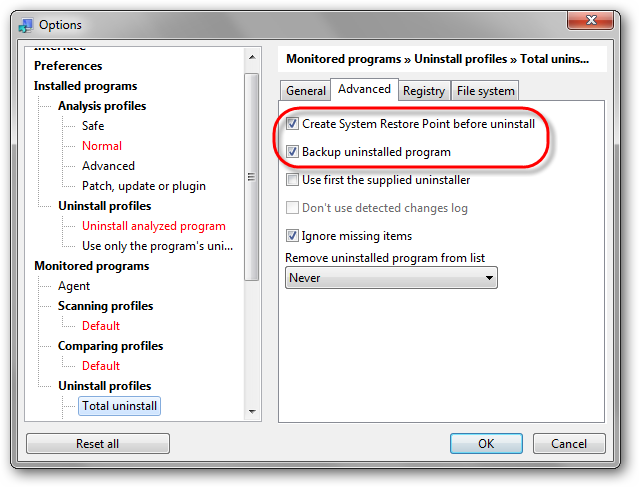 Once an Installed program is uninstalled the program entry is removed from the list. Also, the user can remove manually the entry of an uninstalled Monitored program. This is why, we need first to restore the program entry in the program list. 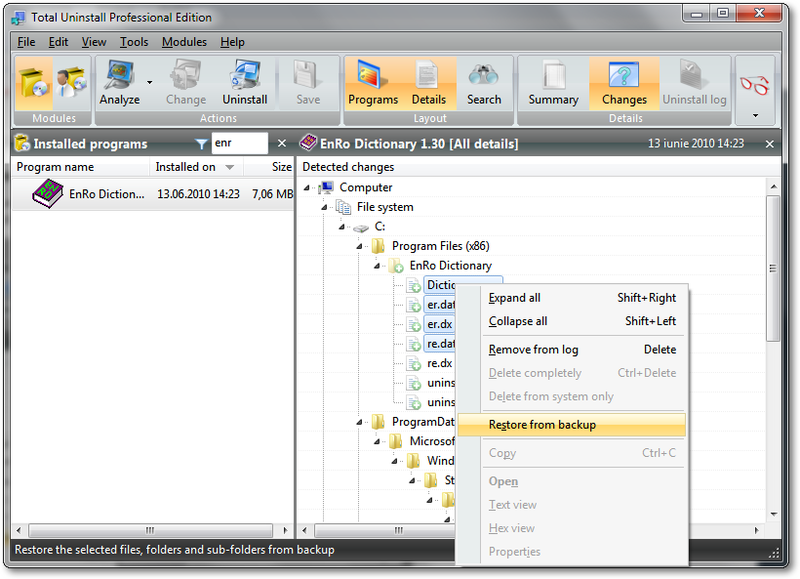 If the backup file exists, the uninstalled files can be restored from it. Restore from backup action will restore the selected files and folders including the folder content at all levels. The Redo action will restore the selected registry item(s). 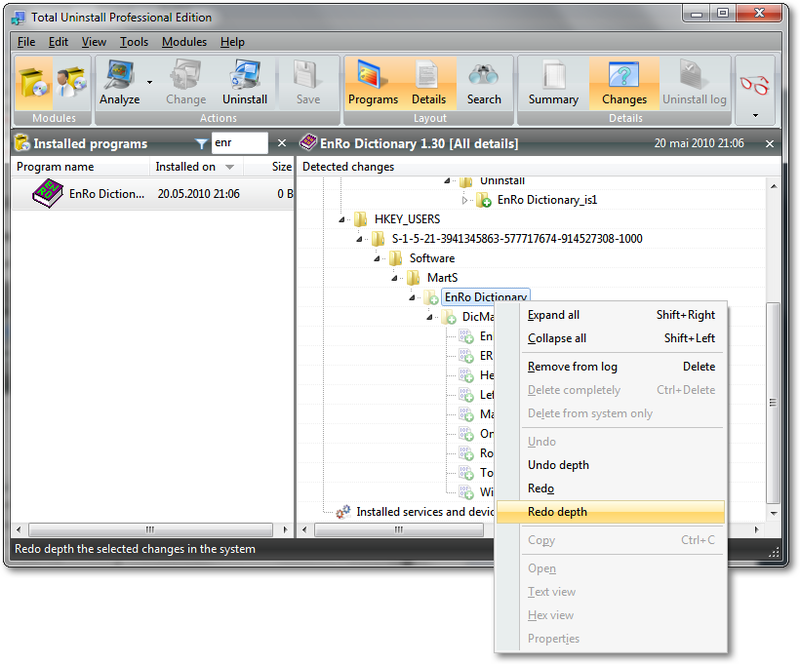 The Redo depth is available for registry keys and will restore the selected registry key and the content at all levels.